They have come up with the most magical bagpipes & drums CD on the market today. The music on this album is accompanied with traditional brass and woodwind instrument sounds. The St. Andrew's Pipes & Drums of Tampa Bay is one of the largest and oldest established Bagpipe Bands in the Southeast, United States.The Veteran Pipers and Drummers of the St. Andrew's Band have been bringing the music and colourful pageantry of Scotland to Tampa Bay and throughout Florida for over 30 years! The St. Andrew's Pipes & Drums of Tampa Bay have come up with the most magical bagpipes & drums CD on the market today. The music on this album is accompanied with traditional brass and woodwind instrument sounds. It was recorded at Peace Memorial Presbyterian Church in Clearwater, Florida, utilizing the church's huge, 55 rank pipe organ on "Amazing Grace" & "Highland Cathedral." The album also includes 3 traditional Scottish tunes performed by soprano, Sheena Mill, and fiddler Perry Craft. The quality is phenomenal, as this is the best "true to life" sounding bagpipe CD on the market today, and is a "Must Have" for any music collection! 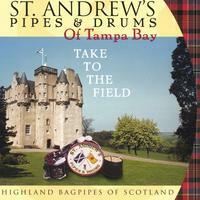 St. Andrew's Pipes & Drums of Tampa Bay do a great job on this cd. That is a wonderful cd. I like it very much. Specially the number Highland cathedral. Great music, we love it. My son is in the Wyoming Pipe and Drum band and they love it too! This stirring CD is an excellent introduction to Scottish pipes & drums. St. Andrews Pipes & Drums of Tampa Bay have produced an excellent CD for those who are curious about this genre of music. Purists and those with vast experience of pipe competitions might find it a bit too basic. However, there is no doubt that the musicians are highly competent, and the arrangements with woodwinds and other instruments are skillful (even though I don't normally enjoy mixed bands with the pipes). The tunes they play so well are virtually all traditional, and most of them are truly stirring. Even I, who play in a Grade 4 competition band, am impressed. Beginners will like "Scotland the Brave" and all the other traditional tunes of which there is an ample variety. I was enraptured by their arrangement of "Lord Lovatt's Lament" and "Will ye no come back again?" both arranged as wonderful, inspiring marches. Some might find the tempos a bit slow at first, but that is the tradition of a Scottish pipe band which, if it is anything, is stately. As a bass drummer, I could not help but relish Rick Russel's "The Drummer's Salute," with its crisp cadences. I recommend this CD to anyone wishing a rousing introduction to Scottish piping and drumming. postscript. Could you please add one slight phrase to my review that I sent a few minutes ago? I wrote that the pipes and drums were accompanied by skilled arrangements with woodwind instruments. That is perfectly true. However, it should have been "brass and woodwind instruments." sorry! Fantastic group. Hope to join you all. Found your site by the web and also the Cletic Shop in Dunedin. Your CD is fantastic and cannot wait to meet you all. Wonderful music, great CD and accomodating website. Great CD .... which I will definitely recommend to my friends. I was particularly impressed with Rick Russel's Drummer's salute which we hope to master and adopt as our own drummer's salute. Absolutely worth every penny and more, especially for Highland Cathedral. This is by far one of the best pipe bands I have ever heard. I'm very glad to have purchased the CD.